Anchorage School District buys 3,900 Chromebooks for state testing | KTVA Anchorage CBS 11. Each month the CRSD Snippets will highlight one of our dedicated employees. We will randomly draw a name so that every employee in the district has the opportunity to be recognized for his or her unique and essential role in providing a quality education in our rural environment. This month, we are pleased to present Kathi Hindman. One Interesting Thing About You That Might Be Surprising: I have served this community since 1991 and 1992 as both an EMT and Firefighter. I have taught two classes of Emergency Trauma Technician (ETT) and Community Emergency Response Team (CERT) training to high school students. Two years ago I worked with a foundation whose goal was to teach every 8th grader in the state of Alaska Compression on CPR in which one student went into the community and taught 103 other people how to do Compression only CPR. At age 50 I returned to college to earn my Bachelor’s Degree in Criminal Justice: Homeland Security and Emergency Management. In One Sentence, What Advice Do You Have for Students? Work smarter, not harder. Kathi Hindman started working in the Copper River School District in 1994. During that time she has also raised three sons who graduated from Glennallen High School. Currently Kathi has two grandchildren attending Glennallen Elementary. Send Kathi an email, buy her some chocolate or take her out to Tolsona Lodge (her favorite restaurant) to let her know how much we appreciate her serving students and families in the CRSD. Also, Kathi is one of our areas most knowledgeable trainers for emergency preparedness. You can improve your organization’s capacity to respond adequately to a natural disaster or other emergency by inviting Kathi to share her expertise. 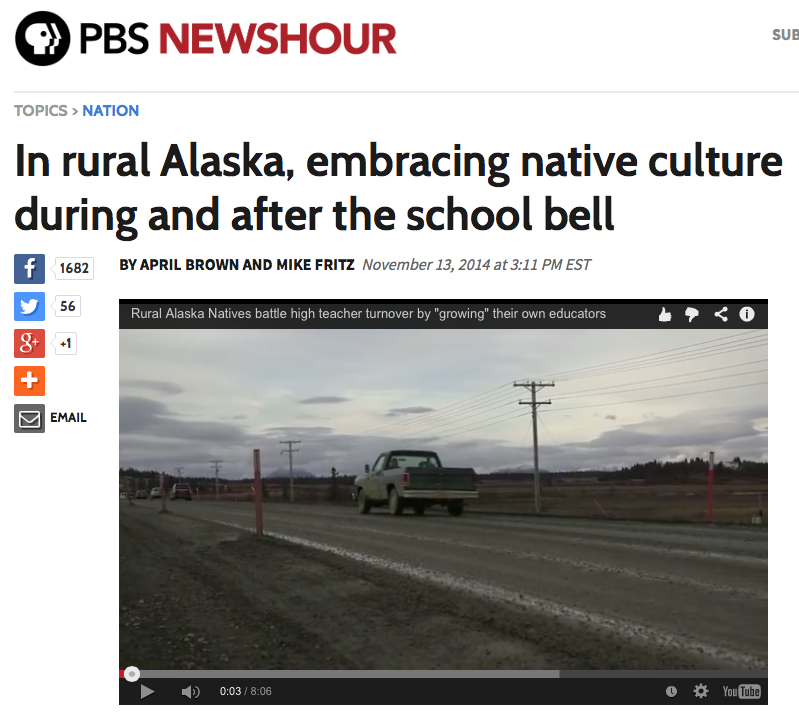 In rural Alaska, embracing native culture during and after the school bell | PBS NewsHour. This past week, the Alaska Association of School Boards held their 61st Annual Conference in Anchorage. It is one of the largest education related conferences held in Alaska each year. School board members from Barrow to Ketchikan attend together, learning from each other and the presenters. Expert presenters and many sectionals at the conference also equip board members and superintendents to lead a shared vision for quality education. Sectionals during the 2014 conferencing included such titles as, “School Law”, “First Robotics in Alaska”, “Foster Grandparents/Elder Mentor Program”, “Alaska Career and Technical Education”, “Playground Safety Programs” and many others. Handouts and other documents shared with board members at the sessions are on the AASB website at www.aasb.org. All seven members of the Copper River School District Board of Education attended this year’s conference. Each of them interacted with board members from all across Alaska. They shared with others about our challenges in the CRSD and learned about the issues facing Alaska’s other school districts. The next time you bump into a CRSD board member, ask them what they learned at this year’s conference that will guide them as they set policy in the CRSD. I’m confident you’ll learn something new and appreciate the time and thought our board members invest in providing a quality education for our students. When time permits, please take time to visit www.aasb.org. In addition to resources from this year’s conference, you’ll also find information about AASB’s many other projects, including their tireless advocacy for public education. The old maxim “What gets measured gets done” holds true whenever a goal is coupled with accountability measures to check on the progress of that goal: You tell your child to clean his room on a Saturday afternoon, and you check on the progress every now and then until the room has been tidied to your satisfaction. You set a weight loss goal and step on the scale every morning until the desired number shows up on the display. You take your car to a mechanic to have an annoying rattling sound diagnosed, and the mechanic tinkers away until the problem is fixed. You send your student to school each morning and expect that he or she will learn new information, skills, and concepts. In our schools, educator evaluation systems have served as the measurement for “what gets done” in the classroom. However, evaluation systems of the past typically included a principal or observer spending a bit of time in a teacher’s classroom to ascertain what the teacher was doing, and then providing a general rating that didn’t necessarily measure the real goal of what we want to happen the classroom, which is student learning. Along with myriad other changes in the Alaskan education system over the last few years, the educator accountability system is also in the process of a major overhaul to ensure that what we want to “get done” in the classroom is also what is being measured. Student learning should be the primary goal; therefore, the new accountability system for district leaders, school principals, and classroom teachers will look quite different from systems of the past. During the 2014-15 school year, districts across the state are piloting new Educator Accountability Systems focused on helping educators grow professionally and improving the effectiveness of instruction in individual classrooms, across an entire school, and district-wide. Teachers, principals, and district leaders are learning to measure their effectiveness through the careful assessment of student learning. Undoubtedly the requirement of the new accountability system creating the greatest angst for educators is the inclusion of a hefty Student Achievement component in the overall evaluation rating. During the 2015-16 and 2016-17 school years, at least 20% of an educator’s overall evaluation rating must be based on student learning data. In the fall of 2017, that number increases to 35%; and, during the 2018-19 school year and beyond, a full 50% of the evaluation will be based on how much students in the classroom are learning. Questions that arise most frequently when educators talk about the new system focus on the variables that we can’t control: What about students who are frequently absent? What about students who move into our communities and have not gained prerequisite skills in their previous schools? If student learning in measured by various tests, what about students who don’t care about the results…or don’t try to do their best when taking those assessments…or are just having a really bad day, resulting in low test scores? New evaluation regulations require that student learning must be based on “two to four valid, reliable measures of student growth, including statewide assessments,” so educators have reason to wonder how those uncontrollable variables will affect their performance evaluations. Fortunately, the regulations also include flexibility for districts in designing accountability systems that work for them while supporting the ultimate goal. CRSD educators are working together this school year to learn how the new system will work, to familiarize themselves with a new evaluation framework, and to develop student learning objectives (SLOs) designed to measure student growth. It’s a tall order during a school year when we are also implementing a new statewide assessment based on new state standards, which also happens to be the first large-scale computer-based-assessment (CBA) in Alaska’s history. GOP Leaders in Congress Outline Education Priorities – Education Week.